The inconsistency of molecular subtypes between primary foci and metastatic axillary lymph nodes in Luminal A breast cancer patients among Chinese women, an indication for chemotherapy? Patients with Luminal A breast cancer often have favorable prognosis, but some of these patients still have lymph node metastases, it remains unclear what the role of adjuvant chemotherapy is in Luminal A subtype with lymph node metastases. The aim of this study was to find a new method to distinguish which Luminal A patient can be benefited from chemotherapy. 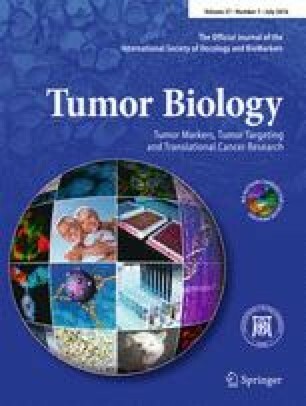 We retrospectively investigated the inconsistency of molecular subtypes between primary foci and metastatic axillary lymph nodes in Luminal A breast cancer patients, and analyzed the clinicopathologic characteristics, Recurrence score (RS), disease-free survival (DFS), and overall survival (OS) in 146 Luminal A breast cancer patients. The discordance of molecular subtypes between primary foci and metastatic lymph nodes were explored by univariate and multivariate logistic regression. The DFS and OS were calculated by the Kaplan–Meier survival curves, and the Cox regression analyses were performed to identify independent prognostic factors for DFS and OS. In our results, the inconsistency was found in 55 patients (55/146, 37.67 %). Lymphatic vascular invasion (OR 6.402, 95 % CI 2.371–17.287, P < 0.001), lymph node stage (OR 2.147, 95 % CI 1.095–4.209, P = 0.026), and histological grade (OR 3.319, 95 % CI 1.101–8.951, P = 0.032) were significantly related to the inconsistency. The inconsistent group (non-Luminal A variations) had a poor prognosis compared with the consistent group, the DFS between the two groups was significantly different (P = 0.022), but the OS did not have obvious difference (P = 0.140). Moreover, the inconsistency was associated with high RS (P = 0.036). In conclusion, more aggressive molecular subtypes in metastatic lymph nodes, which associated with poor prognosis, were observed in Luminal A breast cancer patients, which indicate that chemotherapy is necessary for these patients. Yadong Sun and Xiaofeng Liu contributed equally to this work. This work was supported by the fund of the “Research on Estrogen Receptor Heterogeneity of breast cancer” (project number: 142102410056) and Nanjing Youth Health Talented Person Fund (project number: QRX11111). We thank Lianfang Li (Department of Breast, Affiliated Cancer Hospital of Zhengzhou University) for his expert technical assistance in indirect study. YDS carried out the clinical data analyses and prepared the manuscript. XFL performed the statistical analyses and helped to prepare the manuscript. JXW conceived of the study and gave administrative support for the manuscript. NCCN clinical practice guidelines in oncology (NCCN Guidelines). Breast cancer version 2. 2012, http://www.nccn.org/professionals/physician_gls/pdf/breast.pdf; 2012. Genomic health. Oncotype DX: clinical summary. 2011. Available from: http://www.oncotypedx.com/en-US/Breast/Healthcare Professional/ClinicalSummary.aspx. [Accessed 2 Dec 2011].